The seasonal mean variability of the atmospheric circulation is affected by processes with time scales from less than seasonal to interannual or longer. Using monthly mean data from an ensemble of Atmospheric General Circulation Model (AGCM) realisations, the interannual variability of the seasonal mean is separated into intraseasonal, and slowly varying components. For the first time, using a recently developed method, the slowly varying component in multiple AGCM ensembles is further separated into internal and externally forced components. This is done for Southern Hemisphere 500 hPa geopotential height from five AGCMs in the CLIVAR International Climate of the Twentieth Century project for the summer and winter seasons. 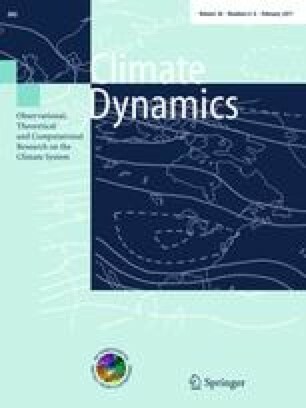 In both seasons, the intraseasonal and slow modes of variability are qualitatively well reproduced by the models when compared with reanalysis data, with a relative metric finding little overall difference between the models. The Southern Annular Mode (SAM) is by far the dominant mode of slowly varying internal atmospheric variability. Two slow-external modes of variability are related to El Niño-Southern Oscillation (ENSO) variability, and a third is the atmospheric response to trends in external forcing. An ENSO-SAM relationship is found in the model slow modes of variability, similar to that found by earlier studies using reanalysis data. There is a greater spread in the representation of model slow-external modes in winter than summer, particularly in the atmospheric response to external forcing trends. This may be attributable to weaker external forcing constraints on SH atmospheric circulation in winter. This work contributes to the CLIVAR International C20C project. J. Sisson assisted in the collection of the C20C AGCM data. S. Grainger is supported by the Australian Climate Change Science Program of the Australian Department of Climate Change. X. Zheng is supported by the New Zealand Foundation for Research, Science and Technology (contract C01X0701) and the SRF for ROCS, SEM China. J. Knight, C. Folland and D. Fereday were supported by the Joint DECC, Defra and MoD Integrated Climate Programme—DECC/Defra (GA01101), MoD (CBC/2B/0417_Annex C5). E. Jin and J. Kinter were supported by grants from the National Science Foundation (ATM-0332910), National Oceanic and Atmospheric Administration (NA04OAR4310034), and National Aeronautics and Space Administration (NNG04GG46G). Comments from M. Zidikheri, H. Zhang and two anonymous reviewers helped to improve this paper.